Delayed-Onset Muscle Soreness is also referred as “DOMS”. This muscle stiffness or soreness occurs 24-48 hours after an intense training session or when introduced to a new training program. In fact, I am guilty of having this right now, as I haven’t squatted for a while, and my legs are heavy and sore. People think DOMS is caused by muscle hypertrophy (muscle splitting, thus gaining more muscle fibres) or it’s lactic acid setting in the muscles. This is simply not true, and I can follow up with a more in-depth article on DOMS. We do think it is caused by trauma or even micro-tears. The best cure is time. Like the common cold, eventually it will go away. But as athletes, we cannot wait for that. We need to train the very next day. Because if we don’t, our competition is training! Conversely, stress and lack of sleep only make things worse. Anyone who stayed up late hours packing and moving a dwelling would know what I’m talking about. So what can you do to speed up the recovery of DOMS, either for the same day relief, or for the next day? There are plenty of scientific studies out there, as well as witchcraft. Here are some ideas that I have tried, based on suggestions from coaches, athletes, therapists or (heaven forbid) surfing the Internet. Do a good warm-up or do a sprinter’s Tempo workout (not a distance runners’ tempo workout). Why? More oxygen and glucose, which are the 2 best items for recovery. 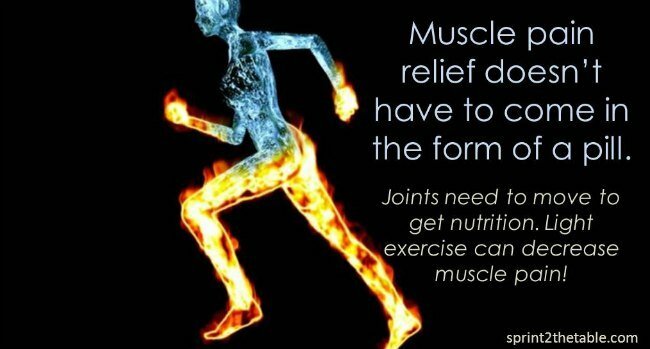 As well, more heat to the working muscles, which allows more flow (dilation) from the capillaries to the sore muscles. Do a concentric weight workout. It is believed DOMS can be worsended by eccentric training, which is why it is used to induce DOMS in a scientific study. If you quads are sore, I can imagine plyometrics causing your grief, but a session of plain old squats may be better, if you believe something is better than nothing. Train through Pain is probably the motto used here. Ice and Ice Baths. Let’s face it, ice is nice. It shrinks swelling, and increases blood flow afterwards for injuries. The problem is your skin and fat gets in the way. Prolonged ice treatments results in frostbite. Epsom Salt Bath. I don’t think there is any scientific proof that a hot bath versus a bath with Epsom salts is better for you. But both are relaxing, and both with help with blood flow, to a certain degree. Read the instructions, you’ll need a lot of salt to make this effective, which you simply throw down the drain anyways. Massage. Again, going back to point number one, anything that will aid in blood flow will be good to recover from DOMS but in this case, the massage must not be too deep, and more of a “slapping, circulatory” type of massage. Acupuncture. This ancient Chinese practice deserves a second look, but I will save that with an interview with Dr. Gerry Ramogida. Low intensity static stretching or Microstretching. There is pending research that this is beneficial for DOMS, as well as improve your range of motion. I personally tried Microstretching back in my days in Vancouver, and my best golf score to date was from a Microstretching session before my game. REgel. I’ve covered the benefits of REgel and I personally use this. It’s a non Camphor or Menthol based gel, which is good because both Camphor or Menthol can cause blistering when used with heat and bandages. Curcumin and/or Phytoplant supplements (such as resveratrol) reduce inflammation throughout the body. Because it is plant based, it can be found in a pill form as well as a rub-on-cream. If you want to go the natural route, this combination shows promise. Topical Arnica Montana, not Hannah Montana. Arnica Montana is the full name, and some of its common names include leopard’s bane, wolf’s bane, and mountain tobacco. In one double-blind trial, Arnica Montana was found to be equally effective as the more expensive Diclofenac for accelerating wound healing after foot surgery, but was less effective than the same drug for pain relief. Traumeel is another homeopathic topical cream you can use. NSAIDS. These mask the pain and there may be anti-inflammatory results from NSAIDS. Non-steroidal anti-inflammatory drugs, such as Ibuprofen, has side effects such as dehydration, damage to the gut, gastric bleeding, and impairs the absorption of nutrients. Risk vs Reward. Pros and Cons. Choose carefully. Caffeine may block central nervous receptors related to pain. But you’ll need at least 5 mg/kg, which is equivalent to about 2.5 cups of strong coffee, or about a single Starbucks version. Other benefits with caffeine is a lower rating of perceived exertion, but that’s for another article. Fish oil is widely regarded as a great anti-inflammatory. Along with the post-recovery workout shake, I think fish oils belong in the top 3 supplements list IF you like taking supplements. I’m a natural foodie, and I prefer real food any day. Invite me for dinner, and we’ll see. Glutamine or L-Glutamine. 5 grams with a 50 gram mixture of Whey Protein is a common post recovery drink. We think Glutamine (along with the other amino acids) is repairing the muscles, since muscle, protein and amino acids are all related. I won’t get into this, as Lyle McDonald’s book, The Protein Book, is by far the best resource on this topic. BCAA. This falls under the same category as Glutamine. BCAAs increase protein synthesis and reduce muscle breakdown, which is why I used to take BCAA in a drink format DURING those long 2+ hour track workouts. Tart Cherry Juice. Why cherries? One would think strawberries as a better food for its high Vitamin C content, and Vitamin C is well documented to help muscle soreness for its collagen repair qualities. However, leading food researchers have confirmed that cherries are rich in Phyto-Nutrients (see Curcumin above) and powerful antioxidants including natural anti-inflammatories, pain relievers and sleep regulators. Besides, it’s 100% natural.